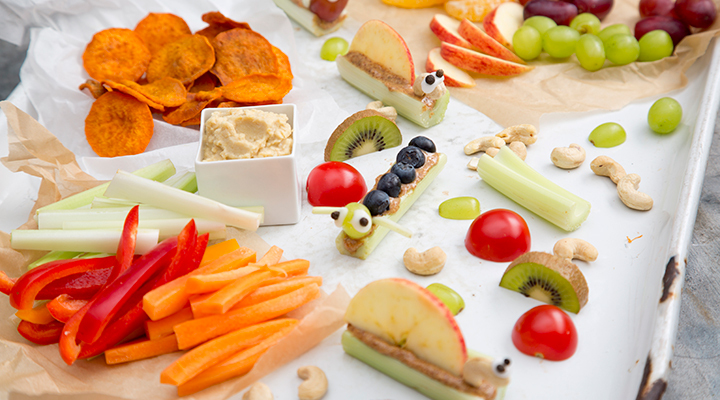 A fun, healthy, after-school snack that your little ones will no doubt enjoy! To make the snails, fill the celery stalks with nut butter. Top with one thin slice of apple, orange, kiwi, cucumber or tomato – this will be the snail’s shell. Add a cashew nut for the head. Use a tiny dab of nut butter to glue on the candy eyes. To make the caterpillars, cut one piece of celery into very small, thin matchsticks to make antennae. Fill the celery stalks with nut butter. Top with a line of grapes, blueberries or cherry tomatoes for the body and head. Use a tiny dab of nut butter to glue on the candy eyes and press the celery antennae into the top of the head.